The Replay Last button re-traces the last brush stroke (from mouse/pen click to release), regardless whether it was created using the same tool or settings. Directional Brush Stroke specifies that continuous brush strokes are only applied while traveling away from the point of first click. The Spacing slider determines how many instances of the current tool are added by certain brush strokes. Placement Variance. Used by the Spray and Colorized Spray strokes, the Placement slider determines the maximum distance each random dot strays from the center of the cursor drag. Dot placement is also governed by the Draw Size. Changing this value also affects the relative size of each dot drawn. Scale Variance. If the selected stroke is a Spray or Colorized Spray stroke, the Scale slider determines the maximum variance in dot size. If this value is 0, all dots are drawn at the same size. If the selected stroke is a DrawRectangle stroke: normally when drawing 3D objects, a click+drag outward defines a certain overall size, then a drag inward again shrinks only the X and Y axes. Setting this slider to 0 causes all three axes to grow and shrink equally while drawing. Color Intensity Variance. Used by the Spray and Colorized Spray strokes, the Color slider determines the maximum variance in color (for Colorized Spray stroke) or color intensity (Spray stroke). If this value is 0, all dots are drawn with the same color. Flow Variance. Used by the Spray and Colorized Spray strokes, the Flow slider determines the density of dots drawn. Smaller values result in fewer dots, larger values result in more dots. Main Repeat Count. For strokes which apply multiple instances of the tool in a pattern (such as Radial and Grid strokes), the Main Repeat Count slider determines the number of instances applied. For the Radial stroke, this slider determines the number of instances placed around the circle; for the Grid stroke, this slider determines the number of columns in the grid. Secondary Repeat Count. For strokes which apply multiple instances of the tool in a pattern (such as the Grid stroke), the Secondary Repeat Count slider provides the secondary count of instances applied, if one is needed. For the Grid stroke, this slider determines the number of rows in the grid. Keep Square. Turn on the Square button to keep the texture/alpha/selection/or masking a perfect ratio as it is drawn onto the surface. Drag From Center. Turn on the Center button to draw out the texture/alpha/selection/or masking starting at the center of the brush stoke. Roll mode. Press Roll to tile your currently selected alpha in your brush stroke. This is very useful if your alpha is already tileable. 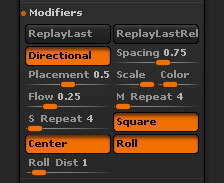 The Roll Distance slider will adjust the roll of an alpha or texture to stretch out to a larger distance. If the slider is set higher then ZBrush will apply the texture/alpha to cover a further distance along the surface.